If you are looking for a suitable place to hold your wedding reception or other celebration, look no further! 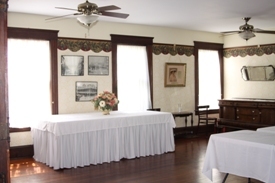 The Springfield Woman's Club is the perfect place for a gathering of up to 125 people. 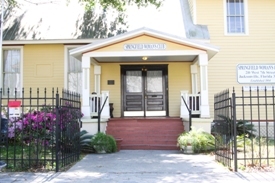 Just a short distance from downtown, North Main Street, and Interstate 95, it is easy to reach from any part of Jacksonville or the surrounding areas. 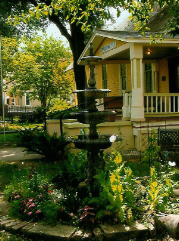 The fountain and gardens make a beautiful background for perfect wedding photographs. 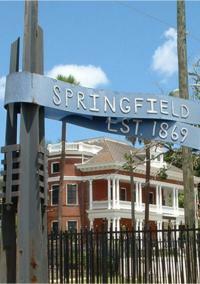 The century-old building, originally the Springfield Presbyterian Church, has been carefully restored to preserve its ambiance. 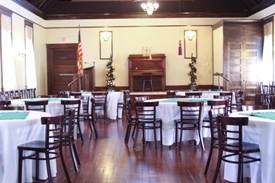 It has polished wood flooring, with a real cathedral ceiling, and an understated decor with a hint of Victorian style. This allows your florist and wedding planner to decorate according to your wishes. The bride will be the center of attention at a reception, not the decor. The interior is spacious and is easy to decorate in your individual style. There are no obstructions to overcome. The kitchen is light and bright. 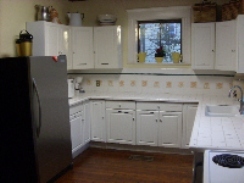 It is fully equipped with an electric stove, dishwasher, and large refrigerator. The countertops are tile, easy to clean and, of course, heat resistant. Several people can work in the kitchen at the same time. This makes the Club a caterer's dream! Tax will be added to these prices. Note: Holiday prices excluded. Please call for rates.